Characteristics, Photograph of Slovakian Prehistoric Ivory Carving. at Moravany nad Vahom, Slovakia. For the 100 most ancient artworks, see: Oldest Stone Age Art. The prehistoric ivory carving, known as the Venus of Moravany, is one of many Venus Figurines produced during the period of Gravettian art of the upper Palaeolithic (33,000-15,000 BCE). These extraordinary statuettes - the first European-wide type of prehistoric sculpture - were carved in a wide variety of materials, including soft stone, bone, ivory, wood, or ceramic clay, and typically depicted an obese (or pregnant) woman. Believed to be some kind of fertility symbol, examples of this type of prehistoric art have been discovered at archeological sites from France to Siberia. Note: Upper Paleolithic Venus statuettes should not be confused with the two famous humanoid effigies from the Lower Paleolithic, known as The Venus of Tan-Tan and The Venus of Berekhat Ram (both dating to 200,000-500,000 BCE). The Venus of Moravany was discovered in Slovakia during the early part of the 20th century. It was reportedly unearthed about 1938 by Stefan HulmanPetrech, a farmer in Podkovica near the village of Moravany nad Vahom, in the Piestany district of the Trnava region of western Slovakia. It was then sent for examination to the world-famous scientist Abbe Breuil, in Paris. 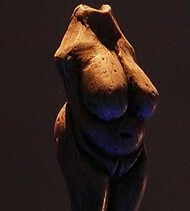 In due course the Venus was judged to be a Paleolithic statue, although it wasn't until 1967 that it was returned to Slovakia. The figurine is just over 7 centimetres in height and is carved out of mammoth tusk ivory. 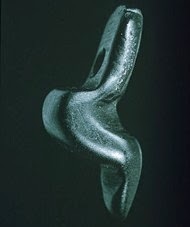 It is carbon dated to about 24,000-22,000 BCE, which places it in the Willendorf-Kostenkian or Upper Gravettian period of Stone Age art. Of course, this tiny carving may not look like a sophisticated item of ancient plastic art, but all anthropologists agree that the carving of a human figure represents an important stage in the evolution of ancient art and therefore a significant step forward in the cultural development of mankind. Several copies have been made of the Venus of Moravany, which are periodically put on public display at the Vienna Natural History Museum, the Bratislava Castle Museum, and the Slovak Academy of Sciences in Nitra. The original is believed to be housed in the National Bank of the Slovak Republic. For the oldest example of cave art from Central Europe, please see: Coliboaia Cave Art (30,000 BCE).  Venus of Hohle Fels (38,000-33,000 BCE) Germany.  Venus of Galgenberg (aka the Stratzing Figurine) (c.30,000 BCE) Austria.  Venus of Dolni Vestonice (26,000 BCE) Moravia, Czech Republic.  Venus of Monpazier (30,000 BCE) Dordogne, France.  Venus of Willendorf (25,000 BCE) Lower Austria.  Venus of Savignano (24,000 BCE) Modena, Italy.  Venus of Laussel (23,000 BCE) Dordogne, France.  Venus of Brassempouy (23,000 BCE) Landes, France.  Venus of Lespugue (23,000 BCE) Haute-Garonne, France.  Venus of Kostenky (22,000 BCE) Voronezh, Russia.  Venus of Gagarino (20,000 BCE) Lipetsk, Russia.  Avdeevo Venuses (20,000 BCE) Kursk, Russia.  Mal'ta Venuses (20,000 BCE) Usol'ye, Irkutsk, Siberia.  Zaraysk Venuses (20,000 BCE) Moscow Oblast, Russia.  Venus of Eliseevichi (14,000 BCE) Bryansk Oblast, Russia.  For information about ancient sculpture, see: Homepage.